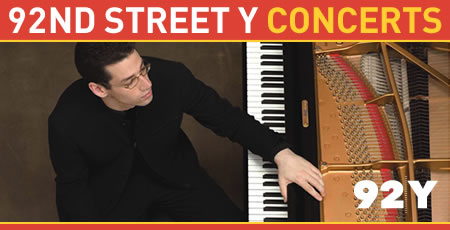 Hailed by The New Yorker as a "formidable musician," 29-year-old pianist Jonathan Biss presents an eclectic program at 92nd Street Y on Sat, Apr 17, 8 pm, featuring works by Beethoven, Haydn, Mendelssohn, and Schoenberg. BEETHOVEN: Sonata in E-flat Major, Op. 81a, "Les Adieux"
SPECIAL OFFER: Order today and receive two tickets for the price of one* on Premium Orchestra ($48) and Orchestra/Balcony ($38) seats! Use code JBBF when ordering. Order online and save 50% on service fees at www.92Y.org/Concerts, call 212.415.5500 or visit the Box Office at 1395 Lexington Avenue at 92nd Street. *Restrictions may apply. Offer does not apply to previous purchases.